LIGA JUSTA (the “Fair League”) is the idea of a group of Spanish football’s fans, who are concerned about the lack of competitiveness within the Spanish LIGA BBVA (hereinafter, “La LIGA”). As a result, the first and second pots are exclusively reserved for R.Madrid and FC Barcelona, which are the only teams able of winning the league. 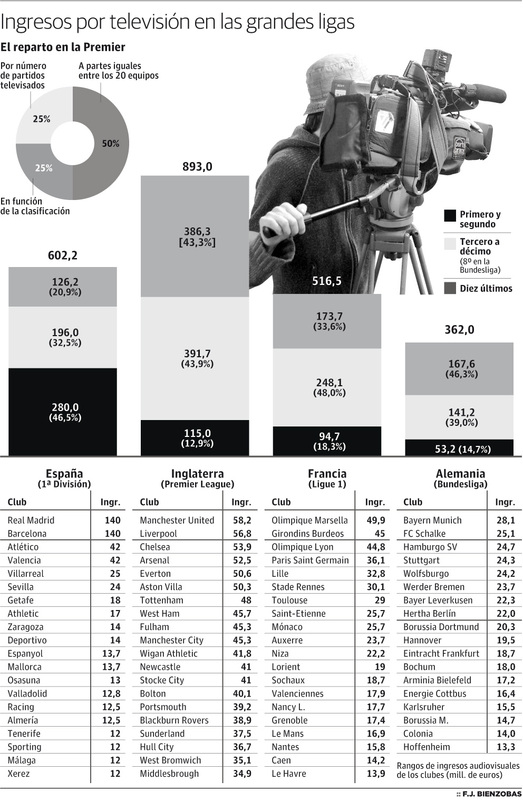 Thus, Real Madrid CF or FC Barcelona earns €128,000,000 (£108,665,000) more than the last La LIGA team, €98,000,000 (£83,196,000) more than the third club in earnings (Atletico de Madrid), and €116,000,000 (£98,446,000) in relation to a Champions League Team like Villareal CF. These earnings are not based on the performance of the teams. Unlike in Spain, in England the difference between the first team in TV broadcasting right (Manchester United) and the last one (Middlesbrough) is of £23,000,000 (during the season 2009 / 2010). This difference only amounts to £4,500,000 in relation to team in position three. For further details please see the illustration below, which compare how TV money is distributed in Germany, France, England and Spain. 3. The remaining clubs €26,000,000. This system will increase the current differences between Real Madrid, FC Barcelona and the other La LIGA’s teams. With the system proposed by these two teams, it might be impossible that clubs like Valencia CF, Atletico Madrid, Athletic Bilbao, FC Sevilla, Villareal CF, Real Sociedad, Real Betis or Real Zaragoza even compete for winning La LIGA. All future seasons in the Spanish Primera Division will be a repetition of the last seasons 2009/10 and 2010/11, in which FC Barcelona was champions 28 points and 25 points ahead of Valencia CF (3rd) and 36 of Sevilla FC (4th in 09/10) and 34 of Villareal CF (4th in 10/11). Through this system R. Madrid and FC Barcelona will perpetuate at the first and second position. As result, we will have a death and unattractive competition. Furthermore, as Real Madrid and FC Barcelona will earn more than €90,000,000 (£80,000,000) than Arsenal, Manchester Utd, Chelsea or Liverpool, they will have a huge competitive advantage for winning every year Champions League title (and the money associated to it). The differences from R. Madrid and FC Barcelona will be every year greater, not only in comparison with the Spanish teams, but also, in the medium- and long term, to other European teams of the importance of Bayern Muenchen, Manchester United, Liverpool FC, Arsenal FC, HSV, Internationale, AC Milan, Schalke 04, Juventus. AS Rom, Tottenham hotspurs, Everton FC, etc. 2) -- 60% depending on five different criteria: 1) PPV, 2) Historical performance of the teams, 3) 5 last-season performance of each team, 4) last year performance, and 5) money for the Second Division and Copa del Rey. 12) The remaining teams an amount between 27,500,000 and 31,000,000. We, LIGA JUSTA, are determined to fight against the proposal of Real Madrid CF and FC Barcelona, defending the competition equality and fairness. We fight for a league similar to the Premier, in which the distribution of the TV rights is carried out on a performance basis, something that tries to strengthen the competition, resulting in a more attractive league. Defending another kind of La LIGA will also benefit international teams by having a more competitive Champions League tournament. There is a final today! RFEF - How Out Of Touch?